Within minutes, Globe artist Tas Emiabata (second from right) had students smiling and laughing through a fast-paced warm-up exercise designed to activate them physically in preparation for the learning activities to come. In Ben Jonson’s eulogy for William Shakespeare, which appeared in the preface to the First Folio — 36 of the Bard’s comedies, histories, and tragedies — he wrote, “He was not of an age, but for all time!” As dozens of Santa Barbara teachers and hundreds of their students learned during the week of February 25-March 1, this observation of Jonson’s was much more than well-deserved praise; it was prophecy. Thanks to a team of artist-practitioners from Shakespeare’s Globe Theatre in London, and to their sponsors, the Léni Fund and Sara Miller McCune, the Bard’s time in our Shakespeare-loving city is now and, through the influence of generations to come, potentially forever. 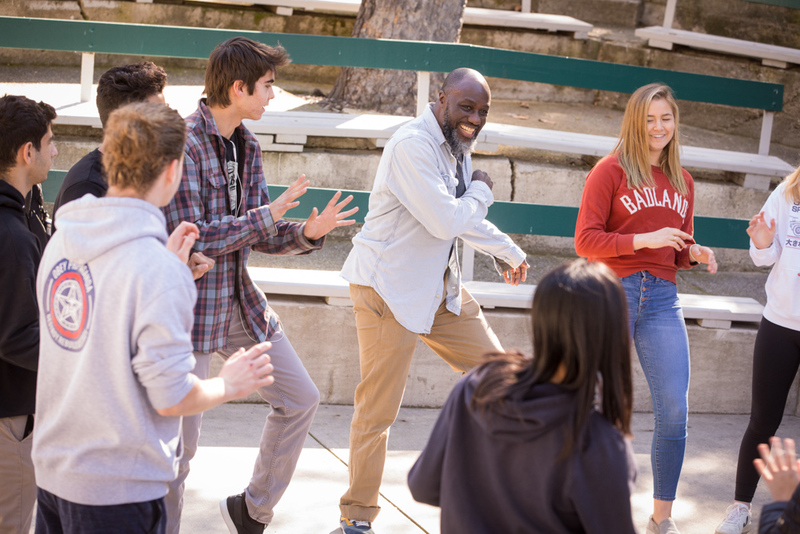 These visits, which are in their third year, represent a significant boost to the culture of Santa Barbara’s secondary schools, not only for teachers of drama and English literature, but for any instructor who desires to implement teaching strategies that activate student engagement with the techniques of rhetoric. Although I reported on last year’s visit for the Independent, this time around I was fortunate enough to observe a class conducted by Globe artist Tas Emiabata and then to participate, alongside 20 enthusiastic educators from the Santa Barbara Unified School District (SBUSD), in a three-hour workshop for teachers. As a result, I got a close look at how these artists communicate the Globe’s sophisticated and strikingly effective strategies for teaching students about the powers of persuasion through reading and performing Shakespeare’s plays. When Emiabata arrived at Laguna Blanca School early on Monday, February 25, he had already done one workshop at San Marcos High School with the students of 9th-grade English teacher Nicole Powers. Thanks to a break in the rainy weather, he could use the school’s outdoor amphitheater, lending a festive authenticity to the occasion that was very much in line with the Globe’s direct, open-air approach. Within minutes of his arrival, Emiabata had the 20 AP English students smiling and laughing through a fast-paced warm-up exercise designed to activate them physically in preparation for the learning activities to come. By the end of the hour, which seemed to fly by, the group had learned multiple techniques not only for improving their performances in an upcoming production of Twelfth Night, but more importantly for deepening their understanding of Shakespeare’s language and its meanings. Most of all, the entire activity was clearly a lot of fun. Later that same day, I joined a group of teachers at the SBUSD headquarters on Santa Barbara Street for three hours of training in a session that was also led by Emiabata. As a veteran teacher with decades of experience, I’ve participated in untold hours of professional development, and I can say without qualification that I have never seen a more positive reaction to a presentation. The material (drawn mostly from Hamlet), was made fresh and challenging through an ingenious sequence of exercises that had us by turns on our feet and fencing with our fingers, carving out dynamic single-word exchanges from lines of iambic pentameter, and challenging ourselves and one another to become at once more present in the moment and more aware of the force and significance of the playwright’s language. While theater directors and students of acting might find some of the exercises familiar, the program’s ultimate orientation points beyond the stage to address the role of performance and conscious presence in real life. In a sequence called “Duels and Dialogue,” we alternated between activities such as the finger-fencing mentioned above and rounds of reflection and feedback designed to put our experiences in a larger context. For example, Emiabata asked us to consider our tactics, to think about how those strategies reflected our understanding of the characters and their situation, and to imagine what these actions meant for our relationships. These discussions eventually led all the way from a series of short play fights and exchanges of lines to ideas about ultimate moral values. If this all sounds abstract, consider that every question Emiabata asked — beginning with “Who won?” — was perfectly simple. The answers were what was complex — exactly the kind of provocation and resonance that characterizes a great class. Real-life issues, full-bodied participation, and visible stakes all came together as a series of simple questions that elicited answers that articulated a continuously expanding awareness throughout the group. Gradually, through what began as a distracting frenzy of activity, the sensations of our bodies aligned with those of our tongues, ears, and brains until the short scene we were practicing between Ophelia and Hamlet coalesced into a flowing current of meaning coursing through the room. Coming from an AP English setting, I found it easy to imagine how all the new strategies I learned could become integral aspects of my curriculum. However, it was not until the end of the evening, when we went around the room sharing what we would take away from the session, that I realized the true scope of the program’s impact. I’ll let Yadira De la Cruz, a teacher at La Cuesta, have the last word on what this extraordinary method promises, not just to elite students, but to all of our community.